How to Help Haiti? Understand it. Bebeto Matthews/AP Photos Luna Charles wipes away tears as she attends a vigil in Brooklyn, New York, Wednesday Jan. 13, 2010. Charles, who has not been able to reach her family in Haiti following a 7.0-magnitude quake, said, "I hope people will extend a hand. Haiti needs us more than ever." The news of Haiti’s earthquake and the devastation it continues to wreak is shocking, but the tragedy has also reminded me of how little I know about the small, impoverished country. Why has Haiti been left so vulnerable, and how did it get to this point? Anyone who’s picked up a newspaper or trolled for news online lately has seen images of the injured, of bodies covered in sheets and left in the streets, of buildings crumbled to bits. We’ve read of shantytowns sliding away—killing, maiming or leaving homeless thousands of people who’d never had a fair shot to begin with. Why weren’t they given a fair shot? Despite being so physically close to the U.S., Haiti might never have crossed Americans’ minds had it not been so harshly thrust into the international spotlight. But if ever there was a time for us to learn more, and to actually put effort into understanding Haiti, it is now. FindingDulcinea’s Focus on Haiti article, which we first published back in 2008, is an excellent starting point for further research. Beginning with colonization in the late 1600s, the sources we’ve cited provide information about Haiti’s early successes (it was the world’s first African American-led republic), and sad failings, such as brutal dictatorships and questionable treatment of Haitian immigrants and their children by the Dominican Republic. Child slavery is also a horrific reality for many Haitian families. Many of us, myself included, may now feel the urge to actually go to Haiti and lend a hand. But unless properly trained, whether as a medical professional or relief worker, we’d only be getting in the way. In a post for community site Gather, Kimberly Ripley writes, “Unfortunately if everyone who wanted to volunteer in Haiti simply packed up and flew to that country, more chaos would ensue.” She provides information on what it means to be a trained and qualified volunteer, and which relief organizations are reputable. Former President Bill Clinton, the U.N. special envoy to Haiti, discussed with NPR the importance of sending monetary aid. “What we need now is cash to buy water, food, shelter and first-aid supplies. That's what we need,” Clinton said. Most of us can spare $5 or $10 for Haiti, and it’s easier than ever thanks to text message donation campaigns. More information about donating to legitimate organizations is featured in this findingDulcinea article, as well as on the Clinton Foundation Web site. You’ve snugly secured your lunch, a chicken sandwich with vegetable fixings and mayo, in plastic cling wrap. But is your lettuce local, your chicken free range and your plastic free of #3 PVC? True, the thought of eating only perfectly clean, chemical-free food seems at times an overwhelming task. But the clutter of opinions and information on the Web has slowly given way to a more organized set of standards. Some products are easier to dissect, ingredient-wise, than others. For instance, in the GLAD Web site FAQ section, the company reveals that it does not use PVC or BPA (Bisphenol-A), a potentially harmful and oft-debated ingredient used in many plastic water bottles. But not all companies make the contents of their products available to consumers. Luckily, there’s GoodGuide, a so-called “B Corporation” that harnesses “the power of business to solve social and environmental problems.” The staff at GoodGuide ranks products’ impact on human health, the environment and other social factors, such as labor force. To determine rankings, GoodGuide consults with experts at academic institutions and nongovernmental organizations, considers government data and works with “private research firms.” The site is in beta, but plans to eventually allow users to sort through ranked products according to their own value systems. Read the GoodGuide Transparency Manifesto to get a handle on the site’s ambitious mission. GoodGuide cofounder Dara O’Rourke, a professor of environmental and labor policy at the University of California, Berkeley, was profiled by Michael B. Farrell for The Christian Science Monitor last month. O’Rourke explains that GoodGuide can help people “make better choices about what they buy,” and contends that “[t]ransparency will make the world better.” O’Rourke’s endeavor, which has involved “scientists and engineers working out of an office in downtown San Francisco” over the past year or so, already boasts 75,000 rated products. GoodGuide seems fast on its way to becoming “a sort of CliffsNotes to the confounding and complex world of ingredients typically—but not always—found listed on the back of everyday products,” Farrell noted. Concerned consumers can also turn to the Center for Science in the Public Interest, an organization that provides helpful information on food additives like artificial food dyes, caffeine and high-fructose corn syrup. The site also discusses the safety of the additives in its glossary, and has a list of banned additives. And for general advice about reading and understanding food labels, read findingDulcinea’s "Foodie" column on the subject. Visit our new section, The Environment, for news stories and features on food and farming; environmental threats; global environmental news; green living guides; wildlife news and more. Our environmental coverage on the findingDulcinea blog has been varied: we’ve evaluated disaster-relief sites, given you the scoop on eco-cleaning products and divulged our favorite green city guides. Below, we’ve rounded up a few Earth Day-inspired posts for your web surfing pleasure. Research centers located around the world are dedicated to monitoring the violent storms that seem to be constantly discussed by news networks. Whether you’re concerned about floods, volcanoes, earthquakes or tornadoes, the research center Web sites in this "Sweet Sites" post on emergency preparedness will keep you in-the-know. Last fall, we introduced you to two fun and informative travel sites with an environmental slant. The green city guides are particularly helpful, explaining, for instance, where to walk and view great architecture in Chicago, and how to keep it green in Christchurch. Head over to our post on Green City Guides for further details and chosen links. If you’re a clean freak but hate the chemical smell associated with most home cleaning products, read our post on Green Cleaning. We culled information and tips on keeping a tidy home sans noxious odors and toxins, and linked to our favorite sources on everything from dish soap to laundry detergent. With Arctic ice rapidly disappearing and dire predictions made by some researchers, you might be wondering what the true story is up north. To narrow things down and gain perspective, read our post on Monitoring the Arctic, where we’ve linked to organizations and online libraries to aid your researching efforts. A few short weeks ago, Gov. Bobby Jindal of Louisiana appeared on national television and decried the waste of spending money to observe volcanoes in Alaska. Then Alaska’s Mt. Redoubt erupted. Several times. The current flood threat in North Dakota and Minnesota make it clear that keeping an eye on the situation is vital to preserving people and property from danger and damage. Floods, volcanoes, earthquakes, tornadoes: Who can keep up? Well, research centers across the globe are dedicated to that very purpose, and many of them provide up-to-date information on disaster news, prevention and relief. The National Oceanic and Atmospheric Administration’s Storm Prediction Center provides an animated map of severe weather patterns moving across the United States, storm reports and FAQs about tornadoes and derechos (windstorms). The Centers for Disease Control and Prevention: Emergency Preparedness and Response helps you lay out a general disaster plan for you and your family, and provides preparedness steps for specific (and currently occurring) hazards, such as volcanic eruptions, floods and blizzards. The University of Delaware’s Disaster Research Center doesn’t appear to have much useful information on its own site, but it does link to several other disaster research centers across the globe, including the Aon Benfield UCL Hazard Research Centre (ABUHRC), “Europe's leading multidisciplinary academic hazard research centre,” and the Pacific Earthquake Engineering Research Center. Learn more about one of nature's most dramatic events in our feature article "Nature Wages War: Volcanoes." Find your own "eureka" sites using SweetSearch. For a while there, it seemed like every time I turned on the news, someone was talking about cutting the pork. A lot of people were quite worked up over projects in the budget that seemed unnecessary. So it caught my attention when I learned that England has recently allotted $9 million to funding an initiative to revive the bee population. It turns out that something called Colony Collapse Disorder is causing bees to die off in record numbers. OK, I thought. What does this mean? Fewer kids get stung, and Honey Combs cereal has to change its name to High-Fructose Corn Syrup Combs (which is more truthful anyway). Who cares? But as I read on, I learned that bees help to produce one-third of the food we eat through pollination. Basically, without bees, we’d be very hungry. A few days later, I was reading Nature magazine and discovered that bats are incredibly beneficial to humans. They also help to spread seeds that grow crops. Even vampire bats can be useful, as their saliva may turn out to be a medicine for stroke patients. I was completely inspired. What other animals are we dependent on that we don’t know much about? Could I prove that money for helping the environment wasn’t pork at all, but rather integral to our survival on this planet? Well, I don’t know how persuasive I’d be in Washington, D.C., but I did find that in addition to bats and bees, worms, fish and butterflies provide immense value to humans and the environment. And so I wrote “5 Animals We Need to Survive.” Not only did I learn how to make a worm compost for my kitchen, but I’m thinking of emailing my congressperson. Green travel advice is everywhere lately, but the green city guides below present unusually streamlined, uncomplicated advice. In each Planet Green “Green City Guide” you’ll find ten eco-conscious suggestions, such as perusing Milan’s flea markets or taking a walking tour with the Chicago Architecture Foundation. The tips are thoughtful and specific to each city, and include links to Web sites offering further information. Jamble Magazine has a limited selection of Green City Guides, but destinations are varied, including Bilbao and Christchurch, among others. The guides cover attractions, shopping, food and drink, and green accommodations. General advice on greenish nightlife, music and transportation in each city is also provided. To go green wherever you live, don’t miss the findingDulcinea Green Living Web Guide. Discover how to minimize your environmental impact in ways big and small. For even more ways to go green on the road, try the findingDulcinea Green Travel Web Guide. You’ll learn how to reduce your carbon emissions and find eco-friendly hotels, tours and more. As the year draws to a close, we look back on the stories that captured the nation (and the world) in 2008. Our staff put together a list of the 10 Stories That Defined 2008 that includes the election of Barack Obama, the Beijing Olympics, Somali pirates, and the collapse of Merrill Lynch and Lehman Brothers. Some articles from 2008 that didn't make our staff's list were huge hits with our audience, so with that in mind, here is a list of the top five most popular (according to traffic) findingDulcinea stories from 2008. 5. McCain Taps Relative Unknown Palin as VP. The story of McCain's choice of Sarah Palin for his running mate nearly broke our site record for most visits to a story in a single day, and was a good indication of the media frenzy that followed Palin throughout the campaign. 4.On This Day: Witold Pilecki Allows Himself to Be Captured by the Nazis. Nearly 70 years after it happened, people are still captivated by the story of a man who risked his life to provide information about Auschwitz to the Allied forces from within the walls of the concentration camp. 3. Scientists Develop a Possible Cure for HIV. The world was stunned in November to learn that scientists had engineered "super T-cells" that might be able to attack the virus, testing of this could begin as early as next year. 2.Gay Penguin Egg Snatchers Get Their Own Brood. Many people were intrigued to learn that this couple from a Chinese zoo had been stealing eggs from other penguins and replacing them with rocks, the zoo finally caved in and gave them an egg of their own to raise. 1. Males of All Species Becoming More Female. A shocking study indicated that chemicals released into the environment were causing males of many species (including humans) to develop more feminine characteristics. The Election's Over. How Will the Media Cope? Darfur has become a popular celebrity cause, but according to New York Times journalist Nicholas D. Kristof, world leaders are still too slow to respond to strife in the war-torn region—most recently, the late October attack on a refugee camp in North Darfur. In Somalia, violent clashes involving Ethiopia and sectors of the Islamic Courts Union have reached a boiling point. Clouded in religion and politics, the conflicts are decades old, but now have distinctly anti-American undertones. Late last month, a typically peaceful area of northern Somalia was hit by five suicide bomb attacks within 15 minutes. Blame fell on a group with possible al-Qaida affiliations. Will environmental policies fall by the wayside in the wake of economic hard times? In Europe, the global financial crisis has already threatened “plans to slash greenhouse gas emissions” in Germany and Italy. But French president Nicolas Sarkozy is pushing the EU to maintain “the fundamental framework” of its environmental policies, despite the burden it could infringe on companies, reports Agence France-Presse. Islam is often a central issue in African and Middle Eastern conflicts, and many Americans are uninformed on the subject. Without a basic understanding of the complex religion, how are we to establish progressive diplomatic relationships with Muslim countries, and with practicing Muslims at home? Mahnaz Shabbir, a second-generation American Muslim woman, raised the issue of the media’s portrayal of Muslims in a talk at Kansas State University last month, and emphasized the cruciality of education. “Knowing about other people and other religions starts with how you’re taught,” she said. I’ve used “eco-friendly” products that reeked of chemicals, and tried homemade cleaning solutions that did nothing more than make the apartment smell like vinegar. But there is hope for those who want a clean home that is free of harmful chemicals and unfavorable odors. According to the blog Inhabitat, cleaning products are the number one cause of indoor pollution. So put down that Lysol Antibacterial Spray—it’s full of denatured ethanol, a potential cause of central nervous system depression. Inhabitat tells you what to look for in a green product with straightforward tips, such as, “if you can’t pronounce it, don’t use it.” The blog also suggests safe products. Care2 lists “10 Eco-Friendly Ways to Clean the House.” In addition to replacing toxic products and learning the basics of nontoxic cleaning, the blog discusses disinfectants, what to know about your tap water, the ins and outs of mops and sponges, and other insightful tips. Finally, Grist runs down the problems with dish soaps and all-purpose cleaners; drain, oven and toilet bowl cleaners; furniture and metal polishes; air fresheners and other perfumed products; and provides solutions. The Arctic has been in the news a lot lately. Ice in the Arctic is shrinking at a rapid pace, and some researchers believe that it might melt away completely in just a few years. Use the Web to do your own monitoring of points north. The Arctic theme page, created by the National Oceanic and Atmosphere Administration, allows you to view frequently updated images from the area via Web Cam 3, which provides “a fish eye view showing sky and cloud cover.” Be sure to explore its gallery of older images as well. The National Science Foundation has an overview of its research on both of the poles, the Arctic and the Antarctic. The Athropolis Arctic Library lists Arctic resources alphabetically and by category. Athropolis also offers a Guide to Arctic Sunrise & Sunset. The Arctic Studies Center hosts resources concerning the peoples and cultures of the northern region, including the Ainu, the Vikings, and the Yamal. I moved to Houston last September and Ike marked my first encounter with gyres from the Gulf. Initially I paid little heed to storm warnings: Gustav had just come and gone as a gentle gust, and I had a feeling that hurricane propaganda was just a bunch of hot air. Well, turns out it was—literally and formidably. By Friday, I got serious about storm preparation. But since Ike was my first hurricane, I really didn’t know where to begin. Fortunately, there were more than a few resources to help. The Hurricane Season page on The Weather Channel Web site provided up-to-the minute news and information about Ike’s advance. Once Ike was approaching Galveston, I could watch video coverage of reporters on the scene withstanding 80 MPH winds. Another site that caught my eye was Stormpulse, which provided satellite tracking of Ike and maintains an archive of storms by month, dating from the 19th century. The American Red Cross explained how to interpret storm warnings, and the National Hurricane Center told me how to prepare for a hurricane. The site offered tips that never would have occurred to me, including how to make hurricane straps to help keep my roof intact. When Ike had passed, I turned to information from The Center for Disease Control and Prevention’s “After a Hurricane or Flood: Cleanup of Flood Water” article for tips on how to deal with water damage in my house. Last night we attended an event for NYC & Company, the official marketing and tourism partnership for New York. 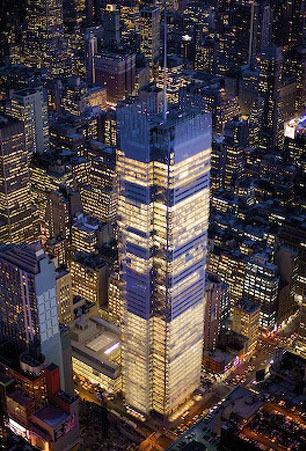 The event was at TheTimesCenter, part of the New York Times Tower. Most of the guests are involved in the NY tourism industry, so a lot of people from hotels, theaters, tour guides, etc. We are involved in the group primarily because we wrote the ultimate Web Guide to New York City Survival, but also because we are a New York-based company, and it's always good to get involved in the local community and stay informed on what is happening around the city. Appropriate for Earth Day, the folks from a new Web site called Greenopia.com introduced their concept: a local directory of eco-friendly products and services. The site is in beta, and they've started with listings for New York, Los Angeles, and San Fransisco with more cities to come. Another person we were excited to meet was from Not for Tourists, the publishers of a series of guides to major cities (of course we link to them in our NYC Survival Guide). If you haven't checked out their Web site recently, I recommend you do. They have some great features, like every single page of their book is available in PDF format, they have a database of recommended business listings, and an Ultimate Web Index for more sites to explore.